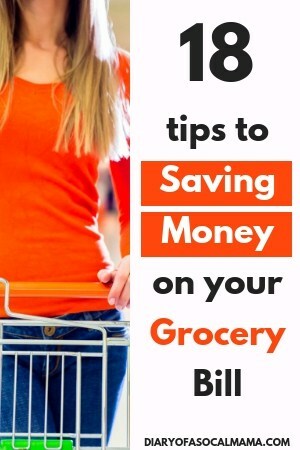 Is one of your goals to save money on groceries? It can be done more easily than you think. 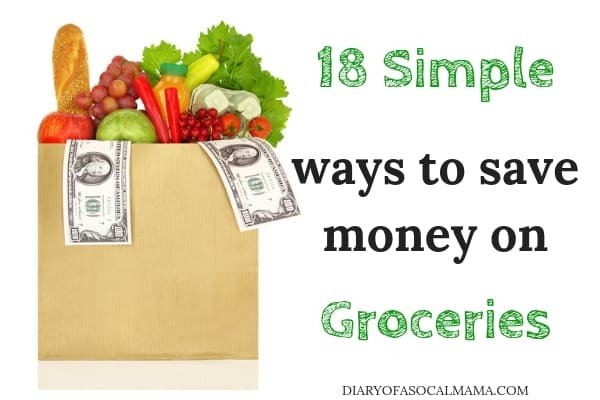 Use these simple tips to reduce your grocery bill and spend less money each month! You’ll be a frugal shopper in no time, and you don’t have to become an extreme couponer to do it! We can easily get on auto pilot and think of groceries as a necessity that we can’t really save money on. But there are simple things you can do without wildly changing your eating habits that can still save you tons of money. The first step is figuring out what your food budget really looks like. Be sure to check out our guide and get the free printable worksheet. Saving money on groceries can be a big part of fixing your monthly budget. Make it simple with these 18 tips, 15 of which you can do without coupons! 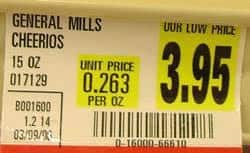 1 – Buy Pantry staples at Target/Walmart – I haven’t found Target/Walmart to be great places to purchase meat or produce (this may be different if you live somewhere they have Super Targets or Super Walmarts). However, they are great places for buying canned goods and pantry staples like cereal, breakfast bars, flour, sugar, etc. 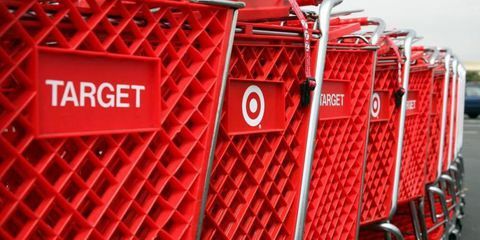 Download the Target app and you can check the price at your store before you go or even place an order for pickup. Pick-up is a great option if you’re like me and having trouble resisting buying a bunch of other stuff every time you step into a Target! These goods generally keep for a while so find a space in your home to put a small stockpile and you can make this trip just once a month so it shouldn’t add too much extra time. Home essentials like laundry soap and paper products should never be purchased at the grocery store anyway! 2 – Shop at a Grocery Outlet store – Where I live this store is actually called Grocery Outlet. They get items that didn’t sell at the regular store or where they received too much. Make sure to always check expiration dates when buying here to ensure you can use the item! You’ll want to hit this store before your regular store as you never know what they will have. Sometimes you may strike out and buy nothing. Other times you’ll hit the jackpot and snag some great deals! 3 – Shop around for the best deals – Like #2 this one can be a bit time consuming. But if you have the time shop around at several grocery stores for the best deals. Checking the grocery store ads can help with this. After a while you’ll get to know who has the best prices on certain items. I used to do this before I had young kids, going to one store can be challenging with a baby or toddler. But once this short season is over shopping around can save you a lot of money! 4 – Check online retailers – While this won’t work for perishable items it works for everything else. Check online retailers like Amazon or Jet.com to see if they have better prices on items you buy. Not only will you save money but you won’t have to haul them into a cart and then into the house so it saves there too! 5 – Use Amazon Subscribe & Save – Amazon has a cool feature called Subscribe & Save. If you can find 5 items or more that you use monthly and are at a better price than you can grab them locally then you should sign up for Subscribe & Save. The even better news is you don’t need to be a Prime member to take advantage, although I highly recommend it! You’ll save an extra 15% off these items and Amazon will deliver them to you monthly! Just ensure you are actually using the items in question! We order things like oatmeal, toddler pouches, the energy drinks my husband likes, paper towels, and breakfast bars. Try this out and see if it helps to reduce your overall food budget. 6 – Buy in Bulk – Buy in bulk but divide it into smaller portions. This is especially helpful with meat products. The cost tends to be less if you buy a large family or value pack. Make sure to divide the meat into smaller portions when you get home and freeze whatever you won’t be using that week. 7 – Check the unit price – Bigger isn’t always better. If the smaller packages are on sale they may actually be a better deal. Check the unit price to find out. Most stores list the unit price on the tag. Otherwise you may have to do some quick math to figure out what the best deal is. 8 – Shop with a list – Make a list before leaving home. That way you’ll know what you need. It will help keep you on track and reduce extra trips to the store when you realize you forgot that one item that you needed. 10 – Skip the Cart – If you are just running in for a couple items skip the cart. This will help keep you from impulse buying extra goodies that you don’t really need as you won’t be able to carry them! 11 – Don’t Shop Hungry – You’ve probably heard this one before. Have a snack before you go to the store. Otherwise everything starts to look tasty and you’ll spend way more than you need to! According to the Smithsonian hunger actually makes you buy more of anything, not just food! 12 – Don’t buy non-essentials if they aren’t on sale – We all have certain snack goods we like to have on hand so this is one that may require a small lifestyle change. Don’t buy these non-essential items like chips, candy, ice cream or cookies if they aren’t on sale. DO NOT pay full price for something that is not essential. Replace that items with something different or skip it until next time. Your waistline may thank you too! I generally have to leave my husband at home to accomplish this as he’s definitely an impulse buyer and not good at delayed gratification! 13 – Stock up when things are on sale – On the flip side, stock up on items when they are on a great deal. Hide the extras if this means that they’ll just get eaten quicker. What’s a good stock up price? This is something you’ll learn over time. You’ll start to know what the average price you pay is so you’ll know if an item goes on sale often and if you can get it at a better price. 14 – Buy Organic Products Selectively – Buying organic is becoming more and more popular. There are definitely pros to doing this but it’s not essential for all items. 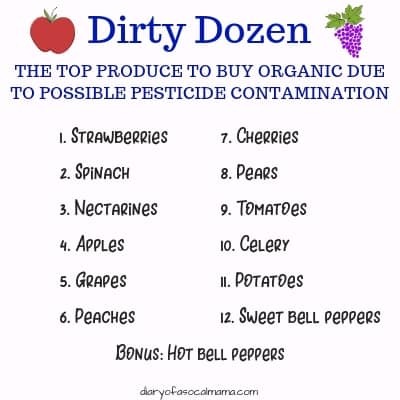 Check out the dirty dozen list and buy organic versions of those. Save money by buying the regular version of other items. 15 – Eat your leftovers – This one isn’t quite a way to save at the store but it will prevent what you buy from going to waste! Cook small portions if you aren’t the type of person who likes to eat leftovers. Otherwise, make sure you eat them! Make yourself a note somewhere or have a set leftover night each week. If you aren’t going to get to them freeze them! A lot of meals will do just fine in the freezer and can be eaten at a later date. Don’t throw your money in the trash can during your refrigerator clean out! We’ve reached the dreaded coupon area! The 15 tips above can all be done without using any coupons! These tips will take a little extra time but don’t require any extreme couponing. 16 – Use coupons – I used to use a lot more coupons than I do now simply because I stopped getting a newspaper. If you aren’t clipping and using more coupons than the paper costs than stop doing it! It’s actually costing you extra money if you only get the paper for the coupons. Pro Tip: If you live in an apartment complex check the recycle bin as coupons will often end up there from people who do get the paper! You can also clip coupons from coupons.com! Print them out and take them to the store with you. Be sure to only print coupons you will definitely use, after all that ink and paper you’re using aren’t free! 17 – Download the store app – Just about every store has their own app these days. Download the app and you can often add deals to your store card. The great thing about this is that the deals will begin to customize to what you buy. Once you’ve been shopping at a store for a while they’ll send you special deals on items you buy! Many of the apps also have a scan feature now. Scan items in the store and it will tell you if there are any special deals available on that item. Check and see if you’re grocery app also offers an extra program to save money on gas. When we shop at Vons we can earn gas points. Each reward gets you .10 cents off at certain gas stations. This can be an extra bonus money saving offer. I also know that I have family members who never use their points so my husband and I use different phone numbers when we buy gas so that those points don’t go to waste! Just make sure you ask first to ensure you aren’t stealing ones that actually get used. 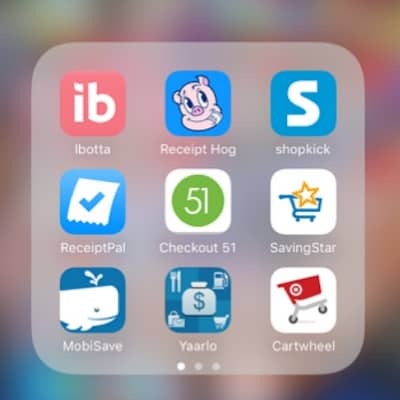 18 – Use grocery rebate apps – There are so many different rebate apps these days like Ibotta and Checkout 51. You can find a complete list in my post all about 21 apps that will save you money.